(Edward) Reginald Silkstone was born in Carlton Scroop in 1899. He was the eldest of the 9 children of William Silkstone and Mary (nee Bembridge). William was an ironstone miner and parish constable. Reginald started working as a farm waggoner. By 1914 he was working as a gardener for Captain Rennie* at Carlton Scroop Hall. He was a member of the choir and a bell-ringer. He volunteered for the Lincolnshire Regiment soon after war broke out in Aug 1914. 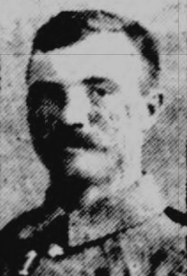 He was sent to France with 7th Battalion in July 1915 and was wounded twice. He was injured during the opening days of the Battle of the Somme and died from wounds on 5th July 1916. He is buried at Heilly Station Cemetery, Mericourt-L’Abbe. During the 1916 Somme campaign there were 3 casualty clearing stations around the Mericourt-l’Abbe. His name is also on the Carlton Scroop memorial window.